I was tired last night. Too many consecutive nights without enough sleep, I guess, and I was quite content to go to sleep around 9pm. Before heading to bed, though, I took a peek outside to see if the evening’s forecast of thunderstorms had any merit. At first glance, it didn’t look like it. The air was warm and while there were ominously dark clouds overhead, the air was still and Oksana and I were able to stay out on the porch in nothing more than a T-shirt and shorts. It was so uncharacteristically pleasant for a Juneau evening that, despite my desire for nothing more than an early bedtime, we stayed outside and watched the weather. A huge black cloud was directly over us. We watched it churn its way north, over Spaulding Meadows before it began to break up. If I hadn’t looked out over Auke Bay to see another large mass of dark clouds forming, that would have probably been it – we would have been asleep by 9:30pm. But I thought that the conditions might be right for a third (a third!) thunderstorm this summer. And wouldn’t you know it, while we were waiting, we caught a few flashes of pink on the western horizon. The clouds over our apartment never gave off any static electricity, but we could tell that the flashes in the west were getting closer. No thunder, though. The storm was still a long way off and I really didn’t want to stay up all night waiting for something that might not materialize. But dammit – I knew I should be out there with my camera, trying to get my first bolt of lightning on film! I had a brief internal debate warring inside me, and sleep lost. I grabbed my digital camera, Oksana grabbed some warmer clothes, and we walked down to Fishermen’s Bend to take some pictures. I didn’t think to bring a tripod, so I was again forced to set my camera up on whatever I could find. That amounted to a low rail set on an elevated section of the dock. It was the only place I could find that didn’t have an obstruction of some sort – a piling, a chain link fence, whatever – blocking the view to the west. I dialed my camera to manual, set the exposure to 15 seconds, and started taking as many pictures as I could. One bummer about my digital camera is that if you take an open-shutter picture that lasts 15 seconds, it’ll lock up the camera for another 15 seconds while it’s either processing the image or writing it to the flash card. It doesn’t make a lot of sense, but I have to live with it. I immediately regretted not using my film camera because I saw many good bolts go across the sky while I was waiting for my digital camera to check up. I did get at least one decent picture of nature’s fury. Okay, maybe not fury – call it “nature’s irritation.” (Click here for a larger version of the above picture.) Actually, once I got home and looked at the pictures on my computer, I noticed that I captured at least one other bolt and a couple sky-brightening flashes as well. I consider that half-hour well spent. Eventually, though, the wind started to pick up to the point where it threatened to shake my camera around on the two quarters I was using as a tripod substitute. Open-shutter photography abhors a shaky camera, but I was willing to wait if it meant more chances to capture those elusive strokes of lightning. Strangely, as the wind increased, it seemed as though the storm was dying down. Although the lightning had gotten noticeably closer, we only very rarely heard any thunder and the time between flashes had increased from every 30 seconds or so to four or five minutes. When the first raindrops started coming down, it was obviously time leave. As Oksana and I started back to our apartment, we marveled over how much different the weather was from just a half-hour ago. Before the air had been still and warm and the only sounds you could hear were the occasional cars driving by. As we left the dock, the wind was hissing past our ears; giant, 12-inch waves were crashing on the shore; and the first drops of rain we starting to become audible as they hit the ground. We got home and waited on the porch again, hoping for one more picture of lightning, this time behind some tall pine trees, but there wasn’t much left to see. The rain abated quickly, too, making me regret leaving the dock so soon. As we reviewed the pictures on my camera, I at least realized I’d made the right decision. I can sleep any night, but who knows when I’ll be able to take another picture of lightning in Juneau? We ended up going to bed around 10:30 to the sound of a brief, torrential downpour. Our apartment was so hot that we had opened our bedroom window and as I teetered on the edge of unconsciousness, I was brought back to reality by the sound of a wall of rain approaching us from Auke Bay. It engulfed our apartment, pounding on the metal roof above and the black asphalt below, before rapidly leaving us behind. The squall couldn’t have been much more than 100 yards wide, because less than a minute after it had woken me up, the only sound I could hear was the gurgling of the gutters. Despite going to bed a little later than I would have liked, I slept very well last night. The rain came and went and although the sound would pull me from my slumber, I’d drift right back off again feeling safe, warm, and dry. The wind also picked up from time to time and it would blow a cool and very refreshing breeze right through our room. These are the kinds of things I’m used to when I’m on vacation, but it isn’t often that you get night like that in Juneau, Alaska. That is a SPECTACULAR picture. 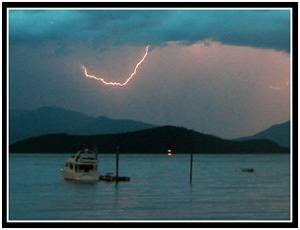 I have never seen a picture of lightning in Juneau before. Thanks for taking it.